It’s a crappy rainy day in December and we’re all just bleh… I’m cranky, the two boys have cabin fever, and my ‘tween daughter is, well, acting like a ‘tween. We desperately needed something to bring us out of our funk, and I figured cookies would be just the trick. 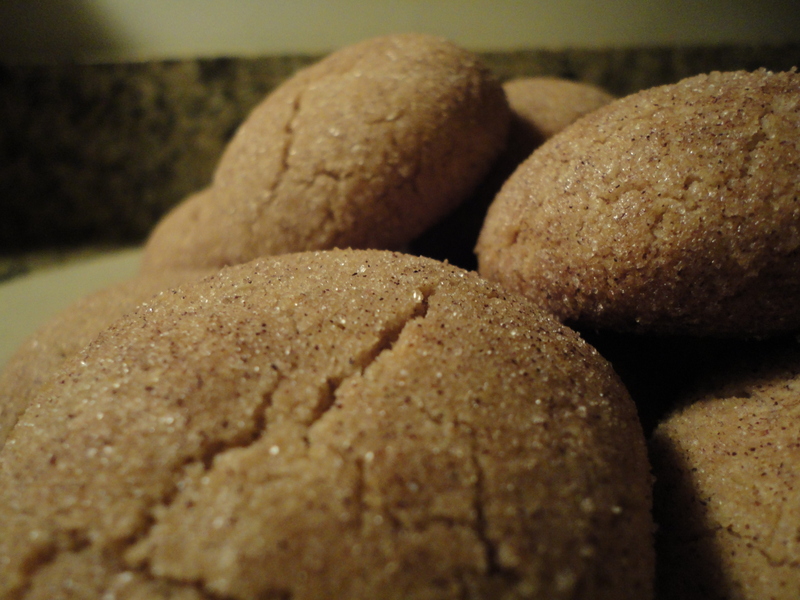 So here you have my recipe for Cinnamon Sugar Cookies. In a stand mixer, or in a large bowl with hand beaters, cream the granulated sugar and melted butter on high until frothy. Add the egg and vanilla extract, mix until a mousse forms. In a separate bowl combine the flour, cinnamon, confectioner’s sugar, baking powder and salt. Add the combined dry ingredients to the butter mixture and mix well, starting on a low speed and working up to medium. In a separate bowl combine the sugar and cinnamon for the coating. Shape the dough into balls approximately 1″ in diameter. Roll the balls in the cinnamon sugar, make sure they are thoroughly coated, and place on lightly greased baking sheets 1″ apart from one another. Bake for 12-14 minutes, or until the edges start to lightly brown. Remove from the oven and allow to cool slightly on the sheets to firm up, then move them to baking racks to finish cooling. Wait at least 15 minutes before serving. Hopefully they’ll put a smile on your faces like they did ours… Enjoy! Tags: baking, cinnamon, cookies, cooking, homemade, perfect pairings, perfect pairings at home, sugar. Bookmark the permalink.